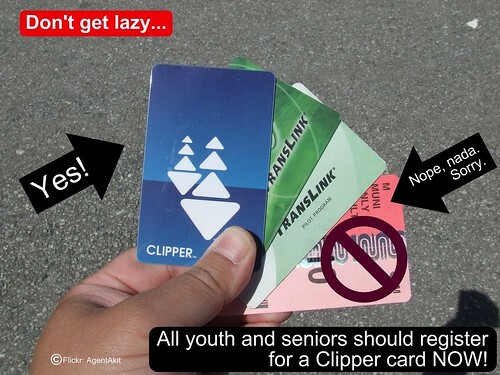 Akit's Complaint Department: Attention Young and Old People of SF: Register for a Clipper Card Now! Do you have a link documenting this? I'd like to see it for myself. A transit agency's site is preferred. "Applications accepted by Golden Gate Transit and Ferry are processed on the spot, and you will receive your card immediately." It's absurd to make every parent in the city set foot in MTA headquarters to get a public transit pass. As you said in your previous post "who even likes going to the SFMTA office down at Van Ness?" Why has there been no presence in the schools, rec centers and playgrounds? Your blog is the first and only place I've even seen this information spelled out. Thanks for the comment. I should have clarified, it's only a one time task for a parent to visit the MTA office to drop off the application. Once the card is received in the mail, the pass can be purchased at any Clipper retailer location or any automated vending machine in the Bay Area. You are correct, it's so odd youth applicants must file at SFMTA while seniors can do so at various locations around the city. I once asked the then Translink "coordinator" at MTA about having enrollment/registrations at SF public schools. Never did get back to me. I finally did get down to the only place on earth that allows you to purchase a Clipper card for your child. Once I submitted the paperwork they told that the card will arrive in 3 weeks. Good to hear, did you go to the SFMTA location or some other one? As a previous commentator said, going to the Golden Gate Ferry office in SF would have issued a card on the spot. Like I mentioned earlier in my post, the youth cards are customized and will automatically become an adult card when it reaches the proper age. There's also the problem with fraud where if the policy changed and vendor can issue the cards, a child goes to several locations around the city, and even if their ID is checked, they could give those youth cards away to their parents or sell them so others can rip-off the public transit systems. Youth and seniors only get ONE CARD in their name. The application process assures that there's no abusing the system. Gees, lighten up. This is only a one time thing you have to do. Once it's done, you just go to any Clipper retailer and replenish the card. To tack on some more, disabled people have to get a RTC card. Applicants visit any transit agency's ticketing office or designated office in their county. Prior to Clipper, RTC cards was issued to those who wanted disabled passes as agencies like AC Transit and Muni issued stickers which can only be attached to a RTC card. Plus, it's the best way to show a transit agency official the passenger is indeed entitled to a discount for a pass or ride as the passenger does not have to carry a doctor's note, disabled parking placard, or other paperwork to show a disability. Akit, what prevents a 20 year old, for instance, from asking her 65 year old mother to get the card and then using it for herself. Does the system notify someone when they use their card coming through clipper..i.e. does it say 'senior' and the person operating the desk can see if it's a 20 year old? A senior card looks different than the blue and white Clipper card. It's actually grey with the word "Senior" on the face of the card. Also, fare inspectors can find out on their readers if it says what user eligibility the person is (youth, senior, adult).